A screengrab of a video of Charles Kinsey lying in the street with a 23-year-old autistic man before being hit by a bullet from an assault rifle fired by a North Miami police officer on July 18. Washington state is a national leader in equipping officers to more effectively deal with people in crisis who are mentally ill or have other disabilities. Columnist Kate Riley shares how her family benefitted. So, there I was July 3 on Interstate 82’s shoulder in Yakima County — and in a panic. The flashing lights from a Washington State Patrol vehicle emerged over a rise and I was filled, all at once, with relief and dread. In the car, my 19-year-old son who has autism spectrum disorder was in a full-on anxiety attack. Car-shaking noise halted our trip to see his sister in Tri-Cities — and he could not understand why we couldn’t continue. Screaming, he threw cellphones, ripped the seal off the car door and repeatedly tried to get out of the car, just inches from 70-mph traffic. Anxiety medication was ineffective. So my husband, his face racked with worry, barricaded the car doors on one side and I, the other — and I called 911. Would this encounter go well or disastrously for my family? I wondered as Trooper Patrick Lockwood approached. My mind clicked through bad stories of law enforcement encounters with people with mental illness or other disabilities. Three years ago in a column about the need for better training, I said the last thing I would do when my son was in crisis was call 911. And then, on that sweltering afternoon, it was the only thing I could do. 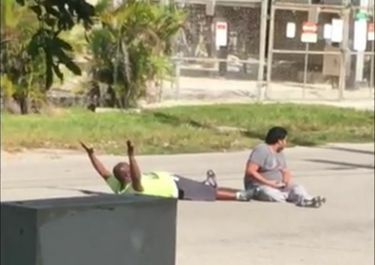 Last week, I felt that same helpless desperation as I watched the haunting video of Charles Kinsey, lying on his back on hot North Miami pavement with his hands up, desperately advocating for a young man with autism and beseeching officers to lower their weapons. Police were called when someone mistook a toy truck the younger man was carrying for a weapon. With my son, it would have been his toy Zamboni. Kinsey, a behavioral therapist, also was trying unsuccessfully to get the argumentative young man — who clearly did not grasp the situation — to lie on his stomach. The Florida Department of Law Enforcement is investigating, but a union official had said the officer was aiming for the man with autism, not Kinsey, who is African American. Two officers are on leave. Trooper Lockwood was the picture of calm. I asked if he could take my husband and son off the highway so I could deal with the car. My son refused to cooperate. I asked if we could force him to get in the trooper’s car. He paused and let me get my mother’s mind around that. The other option was to call an ambulance and get advice from the emergency-room physician. Yes, please, I said. By then, we were surrounded with flashing lights: a second WSP vehicle, a Union Gap Police car, a firetruck and a tow truck. Throughout, Lockwood treated my son like a person, not a problem. While my son, in anguish, begged to see his sister, Lockwood asked her name. Noting my son was sweating, he suggested turning on the air conditioning. Paramedics arrived, their lights flashing, too, and administered a shot and put him on the gurney. As the ambulance drove away with my family safe inside, tears of relief overwhelmed me. Trooper Jason Barry put a reassuring arm around my shoulder. “I think I need to take a class,” he said. Turns out he had. In fact, both Lockwood and Barry have had eight hours of crisis training within the last eight months. Union Gap Officer Rudy Jimenez received the training at the police academy in late 2015. I looked at these gentlemen — and, telepathically, planted sloppy kisses on their foreheads. They did everything right. They took cues from my husband and me, they laid out our options and they treated my son with respect and kept us all safe. These I-82 heroes really showed up for our family that day in a big way. And we will never forget them.